Tonight, Fox News will air Sean Hannity’s interview with Julian Assange—the Wikileaks founder who’s currently hiding in Ecuador’s embassy in London. Fox & Friends talked about the interview this morning, but if you take a look at the banner above, it’s pretty clear we’re deep into the second Cold War. 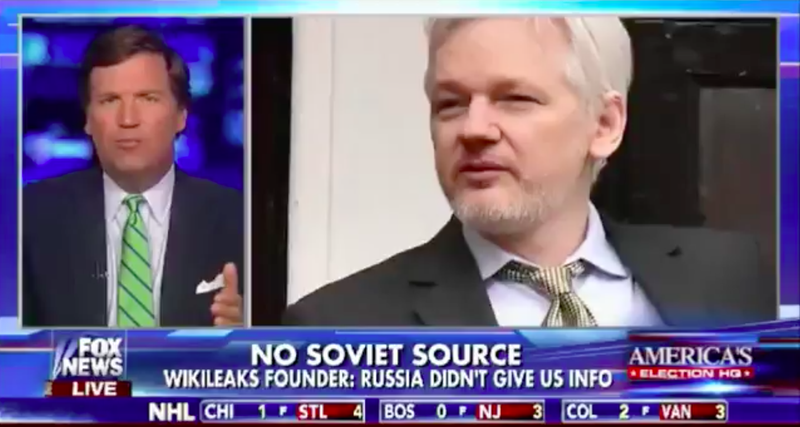 That’s right, Fox News claims that there was “No Soviet Source” for the information published by Wikileaks in the lead up to the 2016 presidential election. The Soviet Union, of course, was dissolved in 1991. Fox News has also published a 30-second clip from tonight’s interview, which Hannity taped yesterday in London. “We can say, we have said, repeatedly that over the last two months that our source is not the Russian government and it is not a state party,” Assange tells Hannity. I guess we’ll have to wait for the entire interview to see if Hannity asks the most logical follow-up: Is it possible that your source had ties to a state party? I’m not holding my breath. The intelligence community, including members of the CIA, have clearly been working behind the scenes to plant this idea that Trump isn’t a legitimate president. But one has to believe that it has less to do with loving Clinton and more to do with fears about what the instability of a Trump presidency will do to world affairs. Tonight’s interview is being billed as “part 1" so perhaps we’ll get a part 2 or part 3 in the coming days. And maybe we’ll see if any Soviet agents come out of the woodwork to travel through time to give Assange some leaked teletype messages.